EL PASO — Ascarate Park in East-Central El Paso has recently become home to a flock of aggressive, starved and abused birds — primarily ducks — as Easter gifts and unwanted pets have been dumped at the lake. Animal rescue workers estimate some 200 ducks and geese have been abandoned at Ascarate as the pets became too much for their owners to handle. 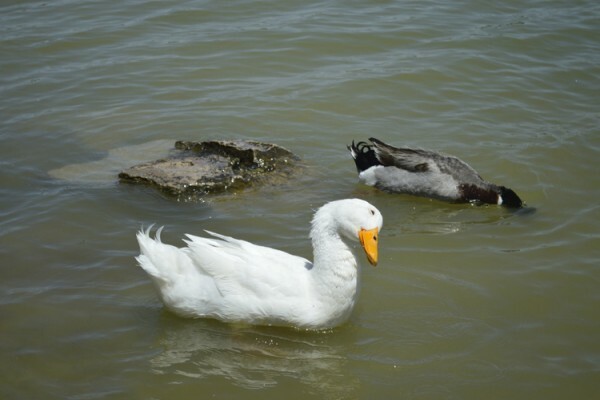 Although no official cause has been established as to how the large white ducks got into the park, Morales believes that it is the result of people who saw the park as a solution to their problem. The sudden explosion of the fowl population has brought complications to park management and a serious threat to the local ecosystem. According to Morales, domesticated ducks are much larger than the local wild ducks, making it easier for them to “bully” the smaller wild ducks. She also explained that unlike ducks that are born in the wild, domestic ducks lack the natural instincts to survive on their own, which puts them at risk of starving to death. Abandoned ducks may also pose a threat to people. According to the Centers for Disease Control and Prevention, live poultry, such as chickens, ducks, and geese often carry salmonella. Older adults, people with weakened immune systems and children who are drawn to the ducks are those whose are mostly at risk of contracting the disease. To make matters worse, these ducks have also been the target of animal abuse. “One duck got shot by a small caliber weapon, another one was sliced and one was even decapitated,” Morales said. El Paso County officials are planning to implement measures to address both the illegal abandonment of animals, which is a misdemeanor and cruelty cases, which can bring felony charges. Norwood echoed the idea that the population growth of domesticated birds at the park was probably the result of people dumping animals that were gifts during Easter celebrations and might be a practice that has been going on for some time. 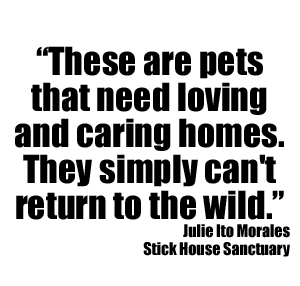 Although efforts are being conducted by both the county and Stick House Sanctuary to gather up the domesticated birds, a lot of work is still required before the problem is solved. “We will continue to come back to the park to try and rescue all the ducks, but they are very hard to catch as they are very elusive,” Morales said. Reports of injured or sick ducks will take priority as those birds might need immediate medical help. Rescued ducks are taken to the El Paso County Coliseum, where they will are quarantined for about two weeks. Stick House Sanctuary volunteers hopes to help and rehabilitate as many ducks as possible and then offer them for adoption. “These are pets that need loving and caring homes. They simply can’t return to the wild, so our goal is to find homes for most if not all of these ducks,” Morales said.